For every app that drains our time and money (we’re looking at you, Clash of Clans…), there are 100s that can make our lives that little bit easier. Surprisingly easy, in fact. This week, we’re focusing on EasilyDo – your very own virtual personal assistant. Oooh! EasilyDo is a virtual personal assistant that automates various tasks on your phone, like saving new contacts into your phonebook and sending people happy birthday messages on Facebook. It can carry out 4 different types of task: ‘navigate your day’ (directions, weather updates, traffic reports, etc), ‘get notified’ (alerts for when stuff is released, happening and so on), ‘stay connected’ (for texts, automated Facebook messages and so on) and ‘get organised’ (sorting out your contacts and emails). To get started, all you have to do is sync up EasilyDo with your existing email and social media accounts. Even though EasilyDo only tackles small tasks (such as texting someone when you’re going to be late for an appointment), the time it saves you soon adds up. In fact, EasilyDo tells you exactly how much time it’s saved you – and it doesn’t ask for a pay rise when it does so either. There’s no single feature that stands out really. 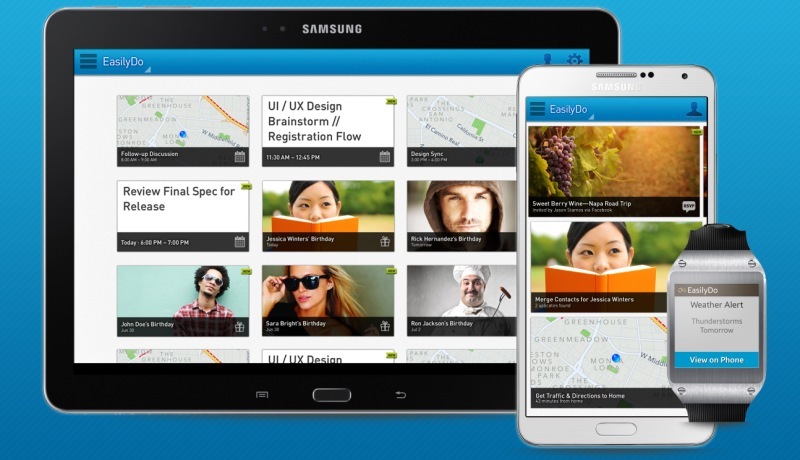 EasilyDo does lots of little things very well, and all of that adds up to a brilliant overall experience. It can’t carry out tasks for you in the physical world, so you’ll still have to do the washing up and take the bins out. Share your favourite apps with us in the comments below! And don’t forget: you can get cash for your unwanted phones with musicMagpie!